Meet one of our artist friends, Annie Howe. Annie is a Baltimore artist and illustrator that specializes in papercuts! We love how magical her work feels and are so excited to have her lead a papercut lettering workshop for us in September! Get to know Annie, her favorite tools and Baltimore spots in our first artist feature! How did you get into papercutting? As people will find out in the workshop the materials needed for papercutting are very simple and easy to get. I started papercutting because I had been creating shadow puppets for years using exacto knives. I wanted to make some gifts for people so I used paper and started out making some basic papercuts. Over the years my style and skill has improved and continued to evolve. What's the most challenging part of the process for you? The most challenging time now is finding the balance between running my own business ( emails,clients,networking) and finding enough time to do the creative R and D that is needed to keep the ideas flowing and my work from staying the same. I love the part of the project where I start cutting and I can just feel that the piece is really coming together. The best part is unfolding the piece ( I start most pieces folded in half) for the first time and seeing how the design is turning out. It is like opening a present!! Everytime. 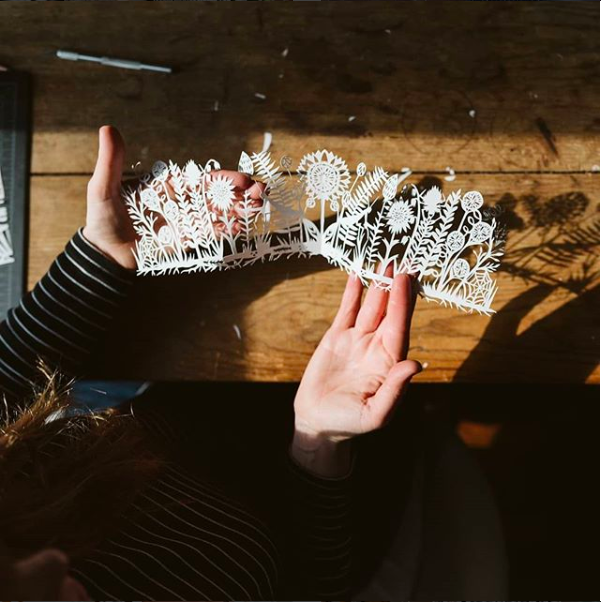 How do you feel that paper cutting displays differently than illustration? I think my papercuts really show the hand drawn, hand cut nature of the work. Papercuts have a magical quality about them that audiences love. You do a lot of large scale installs as well as smaller scale prints and one-of-a-kind cuts. Tell us about one of your favorite projects that you've worked on! I have had so many fun projects I have worked on it is hard to choose. One of my most recent faves has been working on a illustration for the cover of a new Young Adult novel!! I can not wait to share it with everyone. In an increasingly automated world, how do you keep the balance between doing things by hand vs by machine, like a laser cutter? I always start with the original artwork drawn and handcut by me! I think that is important for my process. So even if it is translated into another object it retains the handmade look. I think using lasers and other tools has been an amazing break through for me. It allows me to have items that are accessible for a lot of different prices. It also allows me time to work on larger one of a kind projects. Baltimore has some awesome creative spots like maker spaces and the like. What are a few of your favorites? Yes it does!! I love Open Works for great tools and equipment and community space. For a super fun community centric fabric shop with fun classes and amazing selection Domesticity is the bees knees!! Plus they are located in my old studio space. They have gotten so busy they are expanding to an entire building right next door in my neighborhood. I can't wait! Another semi hidden treasure is the Potters Guild. I know a lot of amazing clay artists that work there. Their classes are great, the space is wonderful and each year they have a major seconds sale!! What's a tool you can't live without? I have been using them for years and years!! Thanks so much for sharing Annie! Keep up with her work on Instagram and Facebook, and join us for her workshop on September 8th at Off the Beaten Track Warehouse.